Delirious Documentations: Shakespeare Wrote Star Wars? Perhaps you have been seeing this book around? William Shakespeare's Star Wars? Does that ring a bell? Does it just sound like a coffee table or gift book, not something to read and enjoy? Well, well, well, let me tell you otherwise. 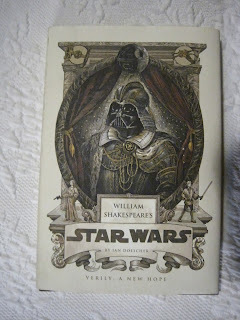 In case you have forgotten, I love Star Wars but feel lukewarm toward Shakespeare. But since I love books, I nabbed this one, if only for the cover. Seriously, isn't that a great cover? And while I'm at it, let me give a shout out to Nicolas Delort, who did the illustrations for this book. I know there aren't a huge amount of illustrations, but the only place I could find the illustrator's name was on the publication page. So let me here thank him for his ability to combine Shakespearean imagery with Star Wars in a mixed, almost comic book style. Besides the cover, I especially love Jabba the Hutt. This book, as one might have guessed, isn't about comedy or parody; it just makes sense. Star Wars being such a classical story, it reads much like a Shakespeare play with all its drama. Ian Doescher translated the dialogue we all know into iambic pentameter, adding in some Shakespearean phrasing and metaphors and soliloquies and such. And it works perfectly. Because we already know what's going on and what everyone is saying, you don't have to work at all to understand them. (And, let's face it, this book isn't as complicated as many a Shakespearean play can be, especially when you're unfamiliar with the story.) So the base is the same, but the lavish details piled on top give a new and rather beautiful perspective. This book made me love Star Wars all over again. Even though I said it was so easy to read, if you're completely unfamiliar with Shakespeare or you really, really hate reading him, you might not have the same experience. But if you're a Star Wars fan and feel even slightly more friendly to Shakespeare than that, you should do fine. This book is that wonderful. I wonder what it would be like in a classroom . . .
Hurrah, then, William Shakespeare's Star Wars is not a coffee table book. It is one to admire on the shelf and in the hand. This book covers Episode 4; perhaps that means there will be more in the future?